2oz Privateer Collection | Siren Ultra High Relief Silver Round Round two of the incredibly popular Privateer series is here! This round will only be in production for a limited time, This magnificent 2 oz round features a theme not often covered by government mints, private mints - or any mints for that matter. Pirates! This ultra high relief round makes a perfect gift for ship lovers as well as being a great way to introduce people to investing in silver. 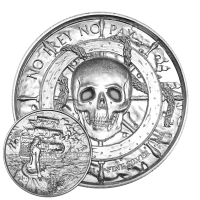 The obverse of this round features a skull centred over a ship's wheel, with the wheel set over a tattered sail. Entwined with the wheel is a braided line. Encircling the top of the skull is the phrase, "No Prey, No Pay". This was a common pirate law meaning a crew received no wages but, rather, shared whatever loot was taken. The reverse features a Siren sitting on a rock in the foreground, doubtless trying to lure sailors to their death on the rocks. In the background there is a starboard view of a pirate ship flying the Jolly Roger. The sails are tattered and torn, the sky is stormy, and we have a feeling that the Siren will not pleased as the occupants of this ship have likely already shuffled off this mortal coil already. Forget the pieces o' eight and doubloons, modern day buccaneers stack the privateer series as their booty!